China appreciates the World Bank's support for the Belt and Road as well as the bank's own reforms, which have increased the share of developing countries, President Xi Jinping said on Monday. The Belt and Road Initiative, put forward by China, aims to promote global development and cooperation through boosting interconnectivity, Xi said while meeting with Jim Yong Kim, president of the World Bank, at the Diaoyutai State Guesthouse in Beijing. The Belt and Road Initiative proposed by Xi is visionary and has greatly promoted international cooperation and poverty reduction, Kim said. Xi said as a responsible major country and contributor to the current global system, China will firmly support the multilateral trading system, push free trade and investment facilitation and achieve win-win outcomes with all sides. There are now new forms of unilateralism and trade protectionism, Xi said. The trend of economic globalization is unstoppable, he added. Xi said that China would like to deepen its partnership with the World Bank, push poverty reduction work around the world, safeguard the open world economy and push building a community with a shared future for mankind. Kim said he fully agreed with Xi's proposal of being brave to swim in the ocean of global economies. The World Bank appreciated China's efforts to support multilateralism and economic globalization, Kim said. 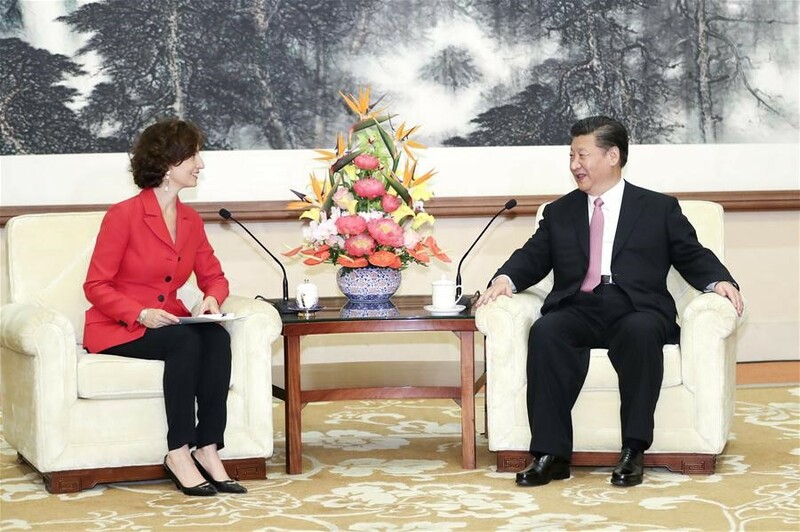 On Monday, Xi also met with UNESCO Director-General Audrey Azoulay at the state guesthouse. The Belt and Road Initiative aims at not only common development, but also connection of the people, Xi said during their meeting. China firmly supports UNESCO playing an important role in promoting global development, and China would like to deepen cooperation with UNESCO to benefit the people of the world, Xi said. Azoulay said that the international community should be open and inclusive, uphold multilateralism and support dialogue. UNESCO would like to enhance cooperation with China under the Belt and Road framework, she added.